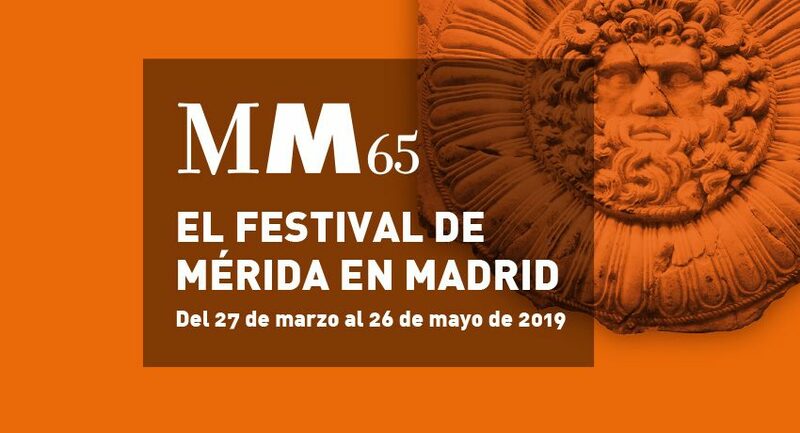 The Mérida International Classical Theatre Festival presents the fourth edition of the Mérida Festival in Madrid. In this occasion, the plays selected to participate in this extension of the festival in the capitol belong to the 64th and 63rd editions, celebrated in 2018 and 2017, respectively. In this edition, the La Latina and Bellas Artes theaters open their doors to three tragedies (‘Nero’, ‘Hippolytus’, and ‘Viriathus’), one comedy (‘The Crazy, Crazy Tale of Ben-Hur’), and one musical (‘The Beautiful Helen’). We can consider Nero an emperor who was an artist, a lover of culture, and all the arts. However, this does not mean he wasn’t also a cruel tyrant and despot, as was usual in his time, capable of murdering his mother Agrippina, his half-brother Britannicus, his first wife, Octavia and, in a way, his second wife Poppaea. He later married a boy-slave whom he ordered to be castrated and dressed as the deceased empress. He wanted to be remembered as an artist: he sang, played the lyre, composed verses, recited and performed plays. He also revived the Olympic Games in order to take part in them. In addition, he was responsible for the first major persecution of Christians, whom he blamed for the Great Fire of Rome. The play shows how, throughout history, nations always make the mistake of permitting the tyranny of bloodthirsty rulers, whether by action or omission on the part of those close to the tyrant. Ensemble: Dani Muriel, Chiqui Fernández, José Manuel Seda, Diana Palazón, Francisco Vidal, Javier Lago, Daniel Migueláñez, Carlota García. Eris, goddess of discord, provokes a tournament to discover which of the three goddesses of Olympus is the most beautiful: Athena, Aphrodite, or Hera. The judge will be a pastor named Paris. In order to win the title of Most Beautiful, Aphrodite promises him the favor of the most beautiful woman in the world: Helen of Sparta. Conflict ensues when Eris plays with the destiny of all in order to fulfill the promise of the goddess of love. Paris will need to duel against Helen’s husband: Menelaus, but also against the high priest Calcas and the Greek kings Agamemnon, Achilles, and both Ajax’s…however, the worst comes when Paris ends up absolutely enamored by the incomparable, sensual Helen. Version by Miguel Murillo and Ricard Reguant. Ensemble: Gisela, Leandro Rivera, Silvia Martí, Tamia Deniz, Graciela Monterde, Patricia Arizmendi, Joan Carles Bestard, Javier Enguíx, Lorenzo Moncloa, Adrián Salzedo, Raquel Martín, Noelia Marló, Joan Codina, Pablo Romo, Guillermo Pareja, Marta Castell, Daniel Balas. Hippolytus is a contemporary classic, and extremely interesting to us nowadays. The confrontation motivated by the love Phaedra feels for Hippolytus will lead her to suicide driven by Hippolytus’ intolerance and fear of what people might say. The defeat of a woman shamed for loving, facing the intolerance of a man who says “I wish all you women would die”, clearly expresses the struggle between genders, in which the woman is always at a disadvantage. The nurse is the voice of reason, a woman who represents unconditional love, and who could not be further away from those goddesses whose sons and daughters’ happiness matters much less than the dispute they hold between one another to prove which of the two is more powerful. In our proposal, tragedy falls on Phaedra. She cannot resist loving Hippolytus. Version by Isidro Timón and Emilio del Valle. Ensemble: Juan Díaz, Camila Almeda, José A. Lucia, Cristina Gallego, Mamen Godoy, Amelia David, Rubén Lanchazo, Javier Uriarte, Raquel Bravo, Sara Jiménez, Estefanía Ramírez, Guadalupe Fernández, Álvaro Rodríguez, Fernanda Valdés. Ensemble: Fernando Ramos, Ana García, Pedro Montero, Manuel Menárguez, David Gutiérrez, Jesús Manchón, Juan Carlos Tirado, Paca Velardiez, José F. Ramos. Nacho Novo and Yllana unite forces to create a crazy, hooligan, and fun version of Ben-Hur, based on the 1959 film. With a breakneck pace and visual wit that they have defined as: TEATROMASCOPE, the set-up allows them to present this epic story to audiences of today without losing the apex of its grandiosity thanks to the constant game between the cinematographic and theatrical languages. Ensemble: Victor Massán, Fael García, Agustín Jiménez, Richard Colins-Moore, Elena Lombao, María Lanau.